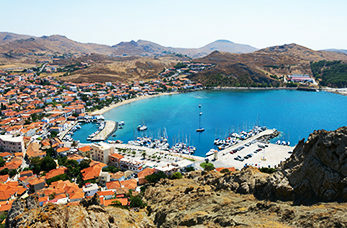 The city of Myrina is the capital of Lemnos, it's situated between two creeks, and backed by volcanic rock and a craggy Genoese castle. Sample the local delicacies and visit the shops for handicrafts and more in its bustling agora. The impressive medieval Castle of Myrina overlooks the town, construction started in 1186 and was continued into the 13th century by the Venetians. Today there are remains of houses, and an underground vaulted room. This lovely sandy beach is one of the most popular tourist resorts in Lemnos, it stretches about 700 metres and has a variety of facilities including umbrellas and sundecks and water sports. Discovered in 1930 by an Archaeological school from Athens, the prehistoric city of Poliochni is considered to be the most ancient settlement in Europe. Explore the ancient artefacts that were found there dating back to the 3000 B.C. Myrina's fine neoclassical mansion-museum contains remarkable exhibits retrieved from excavations that took place in Poliochni, Hepaestia, Imvros and Cabeiro.